Welcome Dear Readers to this week’s edition of Gregory’s Bible Stories. Today Gregory learned about the time the Israelites were having some trouble with the Medianites. This was a horrible punishment to the Israelites because the Medianites were a race of big, fat bullies and the Israelites were more on the bookish side. So the Israelites fled to the hills and hid in caves while the Medianites partied with their gangsta buddies, the Amalekites, in the Israelites’ homes — helping themselves to the Israelites beer, feasting on the Israelites’ food and even using the Israelites’ toothbrush. One day, the Israelites ventured out of their caves to plant some crops and tend their animals. But when they woke up the next morning they found that the Medianites had trampled all their crops and tipped all their cattle. The Israelites couldn’t take it anymore and cried out to the Lord. Angel Who Might Have Also Been The Lord: The Lord is with you brave and mighty man. Gideon: Oh really? Then why is all this bad stuff happening? AWMHABTL: Well, I’m here to tell you that you’re going to need to go rescue Israel from the Medianites. Gideon: Who Moi? Have you seen my muscles? 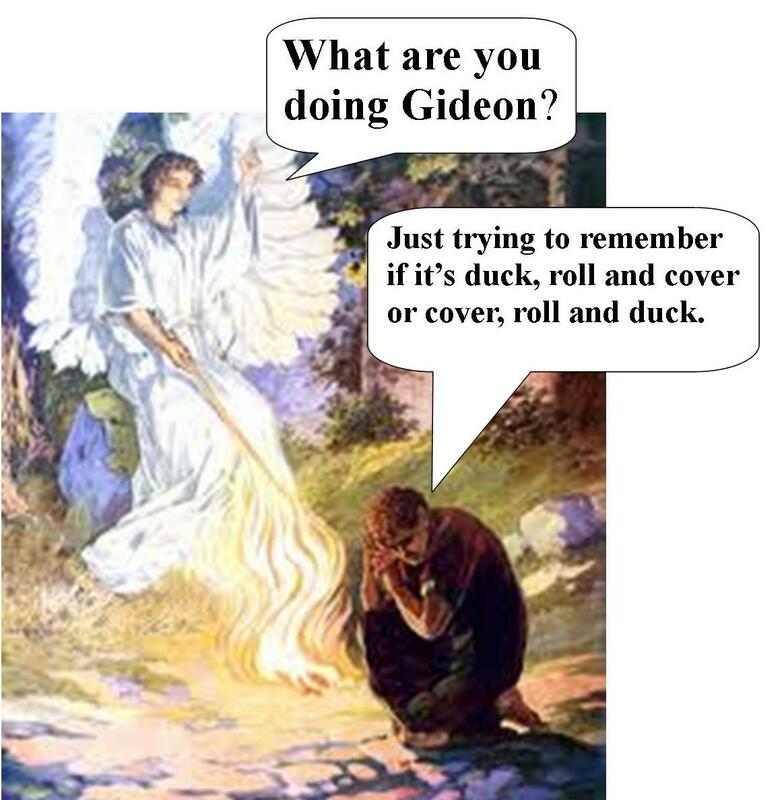 Gideon: I rest my case. AWMHABTL: I know this is a little bit off topic, but I’m really starving. I skipped lunch. Gideon: I’ll be right back, stay right here. AWMHABTL: Thanks. Now put it over there on that rock and stand back. Gideon put the food on the rock and the Angel Who Might Have Also Been The Lord reached out and touched it with a stick and the rock burst into flames.This terrified Gideon. In fact, it would have scared the bejesus out of him had he not been such an old-testament kind of guy. Gideon: Sovereign Lord! I have seen your angel face-to-face! The Lord: Peace. Don’t be afraid you will not die. Gideon: Well thank God for that! 5) Burn second bull as offering using the symbol of Asherah . Gideon: Say Lord, in order to find out if you want to use me to save Israel, I was thinking that maybe you could put some wool on the ground where we thresh the wheat and if in the morning there is only dew on the wool but not on the ground, then I will know that you are going to use me to rescue Israel . . . The Lord: Wouldn’t it be easier to just ask me? The Lord: Wool Schmool! I’m just going to tell you now, you’re rescuing Israel. Gideon: Fine be that way. Well that’s it for part one of the adventures of Gideon, Dear Readers. Please come back next week when Gregory tells us how Gideon defeats the Midianites. Welcome Dear Readers to this edition of My Brain, Peanuts, remembers. Anyway, we all stood around watching our breaths and breathing in the aroma of Sunday School Clay. That’s because our church basement always smelled like Sunday school clay. Sunday school clay is different from ordinary clay by virtue of the fact that it is kept in the cold church basement. So Sunday school clay was always somewhat frozen and by the time you got it warmed up enough to roll it into something as simple as a snake, Sunday school was over. I never understood why they even bothered with having clay unless it was just something to keep us occupied while the Sunday School teacher was earnestly trying to impart some useful biblical wisdom into our somewhat disengaged little minds. Anyway, we all stood around waiting for Santa and shivering beneath the glare of church basement’s fluorescent lights that cast a Russian-esque-like hue over the scene — probably not unlike the same scene that was transpiring on in the opposite side of our cold-war globe in the basement of the Kremlin while communist children waited for Soviet Santa to make his appearance –i.e. 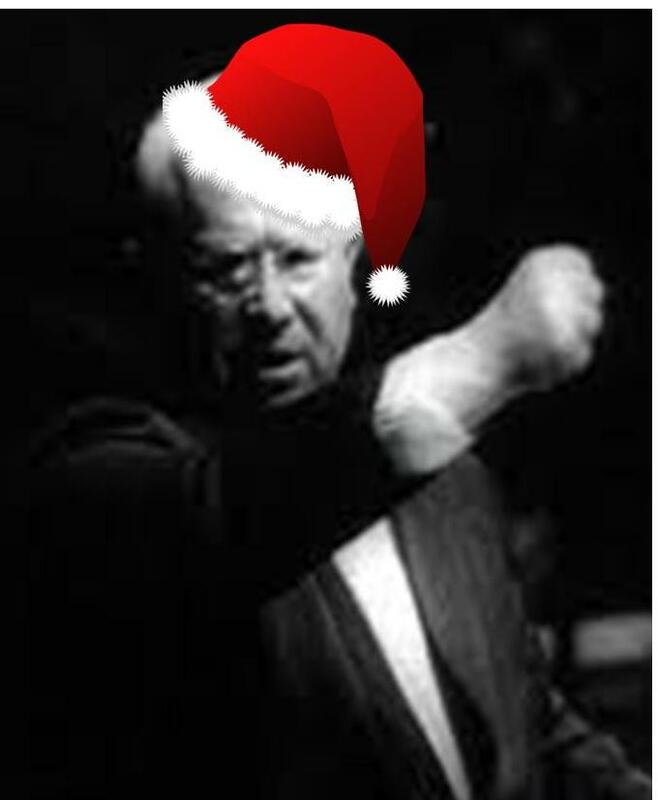 Khrushchev in a fuzzy hat. I will bury you! No wait . . . have yourself a very merry Christmas . . . and then I will bury you! 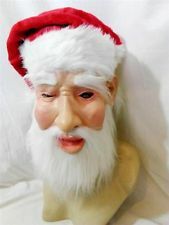 Anyway, when our Santa Claus finally appeared, he was wearing a rubber Santa Claus mask. The weird thing is, I was the only one that seemed to notice. But no one seemed to care. Everyone was on board with this rubber-masked imposter. They were taking candy from him like it was candy. What was wrong with everyone? I screamed! I shouted! I was a three-year-old Paul Revere trying to warn my fellow pint-sized citizens not be taken in by this Santa Claus Charlton! But nobody listened. I do believe in Santa . . . I do . . . I do . . . I do! I wanted to believe her story. I really did. I looked up at the stars and tried to imagine Santa flying through the air. I strained to hear the sound of Santa’s sleigh bells. I neither saw nor heard a thing. Try as I might, the integrity of the Santa story was beginning to form some big, gaping holes. When I was five years old, the subject of Santa came up, and I cruelly broke the news to dear, sweet, innocent, Santa-believing, Jack Hubbard that there was no Santa Claus. I explained that he was merely a figment of the imagination, a tale told by an idiot, full of thound and fury thignifying nothing. (I still had my lisp). A traumatized Jack Hubbard ran home, broken-hearted and told his mother what I had said. Mrs. Hubbard called my mother. Mrs. Hubbard: Jack said Linda told him there was no Santa Claus. Did she tell Jack that? My Mother: Oh gosh I don’t know. Let me ask her (my mother put the phone to her chest). Linda, did you tell Jack there is no Santa Claus? My Mother: Yes apparently she did tell Jack there wasn’t any Santa Claus. Mrs. Hubbard: Why did she do that? My Mother: Oh gosh. Let me ask her. (My mother put the phone to her chest again) Linda, why did you tell Jack there wasn’t any Santa Claus? Me: Because there isn’t any Santa Claus. I don’t remember what my mother said after that, but I do remember that neither my mother nor Mrs. Hubbard were none to happy with me and, frankly, I’ve been feeling guilty about it ever since. This year my five-year-old grandson asked me if Santa Claus really existed. I told him that believing in Santa Claus is a personal decision that he would have to make for himself. This seemed to placate him since he didn’t exactly understand what I was saying. If only I had thought of this answer when I broke the news to Jack Hubbard. Tis that time of year again, Dear Readers! Christmas is fast approaching — when we hang up the stockings, put up the tree, and start using the word “tis” for it’s. And there you have it, Dear Readers! Now get out there and wish your favorite cow a Merry Christmas! Welcome Dear Readers to this week’s edition of Gregory’s Bible Stories. 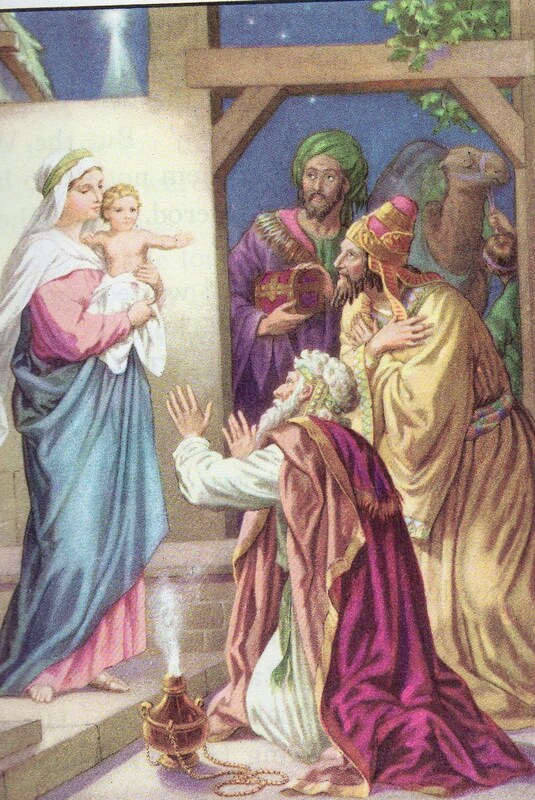 Today Gregory learned about when three wise old men visited the baby Jesus. Once upon a time there were three wise old men who lived somewhere (nobody knows where). Their names might have been Kaneezer, Ferod and Ringo (but nobody knows for sure). They spent a ton of time studying the stars. One night while looking up at the stars there was a very strange occurrence. Kaneezer: Hey guys! Come out here! Lookee what I found! Ferod: What? Just tell us. Ringo and I are trying to eat our dinner, Kaneezeer. Kaneezer: No you’ve got to come and see this for yourselves, guys. You won’t believe it! Ferod: But our bread will get stale . . . you gonna eat the rest of your pomegranates, Ringo? Ringo: Yeah. You gonna eat the rest of your figs? Kaneezer: Listen you guys, first of all, unleavened bread doesn’t get stale and even if it did you’d never know the difference. Secondly, I just saw a star in the sky that is telling me that “The King has been born” and thirdly, it’s double parked outside waiting to guide us to Him. Ringo: A king’s been born? Kaneezer: Not a king THE king! We’ve got to hurry over there and take Him some presents. Ferod: “Presents? But what will we get him? Ringo: How about a dreidel? Kaneezer: I already took the liberty of getting Him a bag of gold, a bundle of incense and jug of sweet-smelling perfume from all of us. Ringo: Those gifts don’t seem very age appropriate, Kaneezer. Kaneezer: Hey, I’m a wise old man, what do I know from babies? Anyway, I also got him a really cute card that you guys need to sign. Now go pack your camels and let’s hit the road. Kaneezer: Wasn’t The King the cutest baby you ever saw when He lay down His Sweet Head? Ferod: I know! And even when he didn’t! Ringo: And did you notice He didn’t even cry when the cattle started lowing their heads off? Kaneezer: I know! And their barn’s right next to the pasture too. 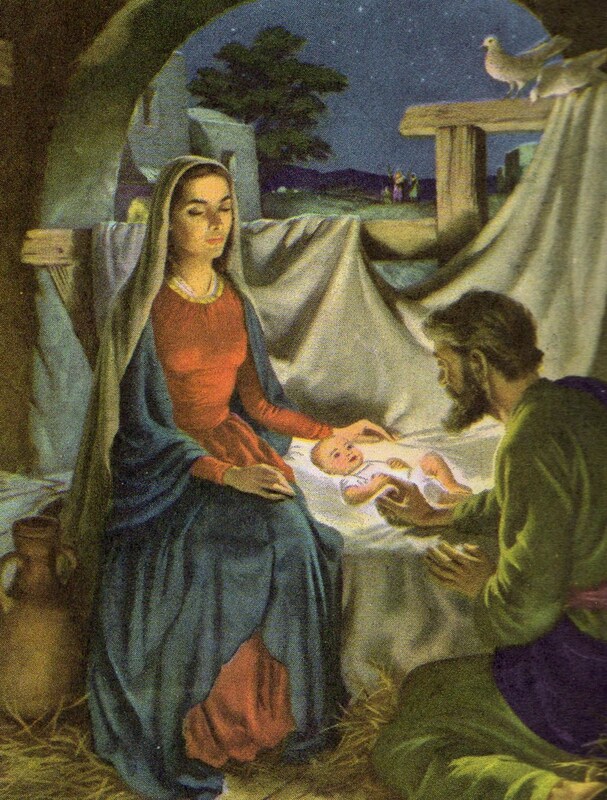 Ringo: Mary and Joseph told me He’s already sleeping through the night! Ferod: Oh good, that means He’s probably not allergic to straw. Kaneezer: Hey did you happen to notice all the stars looking down where He lay? Ringo: I know! Before tonight, I didn’t even realize stars could “look”! Ferod: And did you get a load of all those angels? Kaneezer: I know! I almost wet my pants when they started unfurling their peaceful wings! Ferod: But you’re not wearing pants, you’re wearing a robe. Kaneezer: Oh yeah my bad. Ferod: I know, that’s my new favorite song! Kaneezer: Hey lookee guys! There’s an Inn 6. Let’s spend the night there shall we? Ringo: Okay, but something tells me there’s not going to be any vacancies. And there you have it, Dear Readers. Oh and Gregory would like to take this opportunity to wish you all a very Merry Christmas!